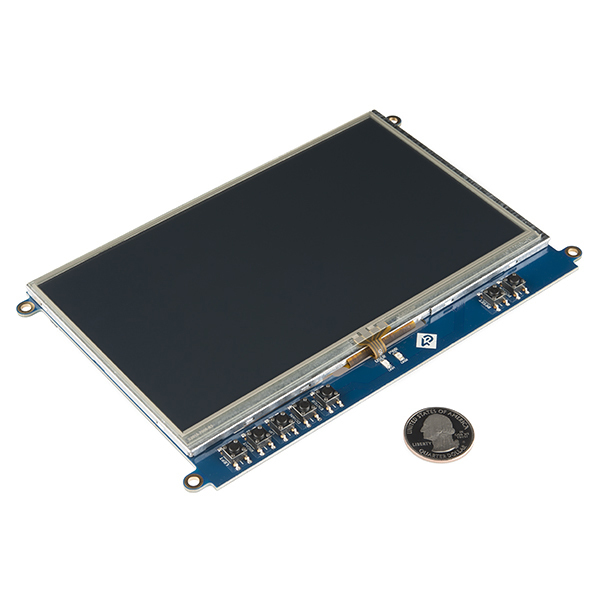 The 7.0” resistive touch LCD touch from 4D Systems is a cape specifically designed for the BeagleBone Black, and provides a 7.0” primary display for the BBB for direct user interaction and information display. The BeagleBone Black connects directly to the back of the LCD cape, and provides everything the cape requires such as power and display signals. 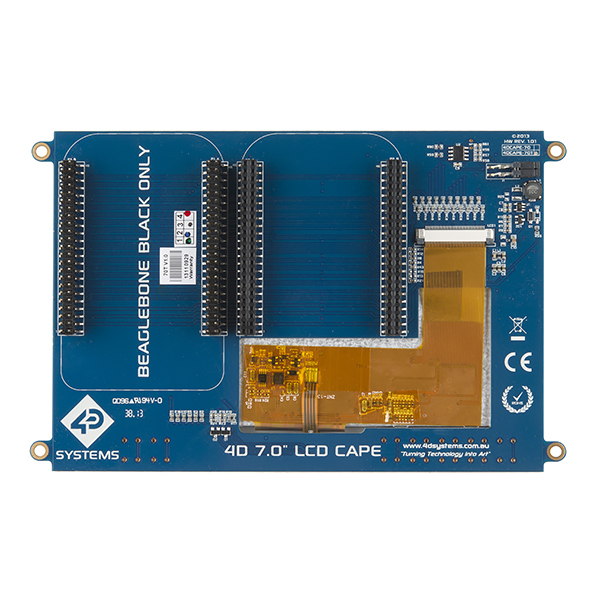 The BeagleBone Black LCD cape features 7 push buttons below the screen, LEFT, RIGHT, UP, DOWN, ENTER, RESET and POWER, along with 2 LED’s to indicate Power and User Status. Mounting the cape is easy with the 4x 3.5mm mounting holes present on it, enabling standard M3 or #6-32 screws to fasten the the LCD cape as required. I don't see this on the description above, so here is the resolution from the datasheet: 800x480. 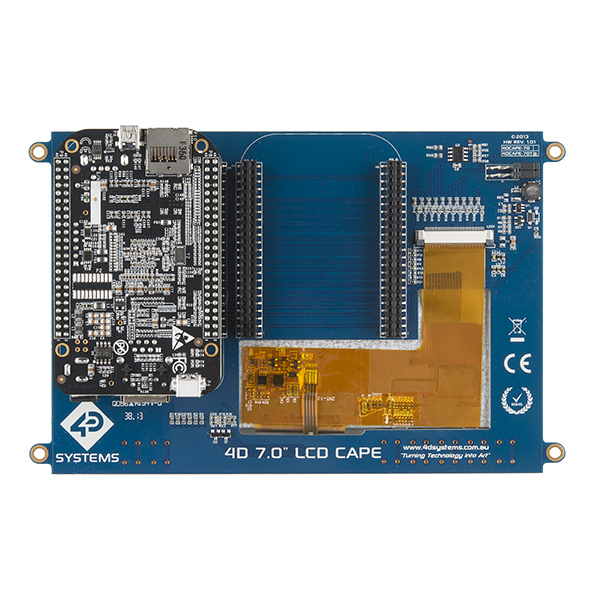 Hello, Is this lcd cape also compatible with debian wheezy? If yes, do you have any guide document about how to enable this cape on BBB debian or things like that. What BBB OS are people using for this cape; ubuntu 14.04 straight from an image doesn't seem to be working. .
Have you got any suggestions for good enclosure? I've got a really rough design for a layered laser cut case. I'll try to clean it up and post it in the next week or so. Hi, any update for enclosure? Does the touchscreen only work inside of X or is does it use a normal touchscreen driver? EDIT: After banging my head against this for a while, I finally got this cape (mostly) working with the SGX video driver using a 3.14 version of the kernel. The kernel image I used was put together by Thing Printer and, while it's limited, if you're trying to do graphics, this image along with a working dts/dtbo file can get you a nice dev platform for embedded, OpenGL ES projects. I had same issue with jittery mouse on touch screen. Sparkfun replaced the unit and the new one works great! Sparkfun has great customer service! I don't mean to beat a dead horse, but I just got my 4D 7" LCD Cape in mid April 2014, and have the same problem as PickledDog: "The one I have appears to work, but the mouse pointer just jitters around randomly in the bottom left corner when Iâm not touching the screen (it follows my finger when I am)." I have read that this is a software problem, fixed in the latest Angstrom and Debian versions, but I have tried both of those with the same result, including the one touted below ("Works really well." http://rcn-ee.net/deb/testing). I also tried an SD img for an Android version (don't have the link handy), but could not complete the calibration with it. I have not tried the Android version direct from the TI site yet. Is there a quick way of ruling out defective hardware? Maybe it is time for the o'scope. You may have a faulty module there. Best to raise a RMA request with the company you purchased from, and get it replaced. If the debian release doesn't work then that suggests a problem with the hardware. Yup, defective unit. Replacement unit works fine. I want to use this simultaneously with a raspberry pi and beaglebone black. So I could have them both connected at the same time and be able to choose which one I have on. Would that be possible, if so, what would be the necessary connections? What's not working? You checked the datasheet out, and the EEPROM jumper settings if you are trying to run Android? 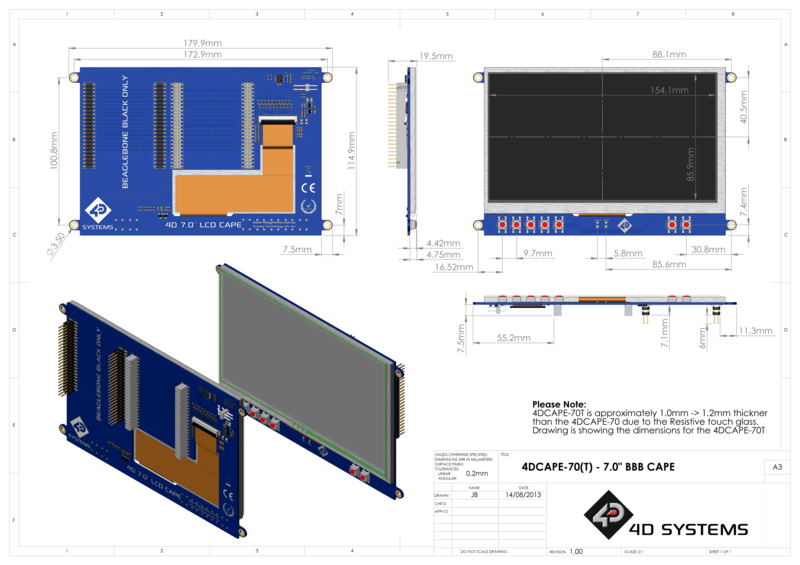 Go to the www.4dsystems.com.au website and go to the product page for the Cape, the datasheet above is out of date. The EEPROM jumper settings aren't the problem. I'm not getting the navigation bar so once I get into anything like settings (a few levels deep) there is no way to get back to the "Home" screen without a hard reset. It's also VERY slow. If anyone can point me to someone who has android working on this like a real tablet... I'd appreciate it. You are running Andrews version of Android it seems (http://icculus.org/~hendersa/android/) ?, which does not have the keys mapped for Android via a Key Layout file. This isn't a problem with the display. The keys just haven't been mapped on that version by Andrew. See something like this, however I personally haven't mapped the keys (http://source.android.com/devices/tech/input/key-layout-files.html). If you use the TI version which is in the Datasheet from 4D, that one works great. Does depend if you are wanting Kernel 3.8 or 3.2 though, as the TI version is 3.2 and Andrews is 3.8. But hardware acceleration for graphics is only working on 3.2 so far I believe, so is actually quite a bit faster than the 3.8. Instructions are inside. Its open source man, always expect to have to do some things yourself. The BBB is not a commercial product with commercial quality software, expect things to be a work in progress. You will notice if you load Android, the problem isn't there. I have the same issue. I am unable to use the touch screen. Plugging in a USB mouse stops the jitter. I contacted 4dsystems and was told it was an issue with the beaglebones and not the screens. They don't sell stands for the LCD capes. Why? It strikes me that this might make a decent display for a DIY oscilloscope. 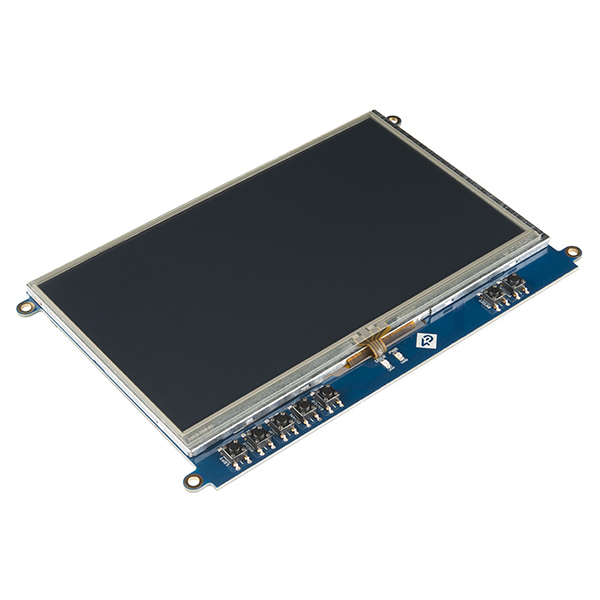 400 pixels vertical is ample, compared with most low-cost 'scopes on the market, which are 8-bit precise in voltage. With the extra ~140 pixels, you could have some extra headroom for dual-trace, perhaps. But I don't know yet how this screen is refreshed, and how fast. Is the entire display refreshed at regular intervals? Or, alternatively, does every pixel remain lit until it is individually addressed and turned off, the opposite for turning on a pixel? Any thoughts? How is the LCD panel held in place? Double side tape? Bought and connected to new BBB with Debian Wheezy. Booted and worked fine out of the box! Config utility for screen worked well. No display after upgrading to Debian Jessie. Adding dtb=am335x-boneblack-4dcape-70t.dtb to /boot/uEnv.txt solved that, but config utility doesn't work and touchscreen calibration is off. Other than that a very nice little screen. I like the resolution, contrast, and response to touch. Definitely would recommend. Very happy with the display. Bright and easy to read. Buttons work great and love that you can power on the BBB with the display power button. Once I figured out how to configure the touchscreen limits with X11, I couldn't be happier. It does exactly what I want I bought it for. This cape was everything I had expected, worked right out of the box with my BBB. I would recommend this cape to anyone who would like a compact graphical display. Excellent, I would recommend this to anyone that needs an LCD display on the BeagleBone Black. Product worked out of the box. There is a large disconnect if you are considering using this to bootstrap into an OEM design. Ease to connect and works. This was ease to put it together and works from the beginning without mess around with software, libraries, etc. 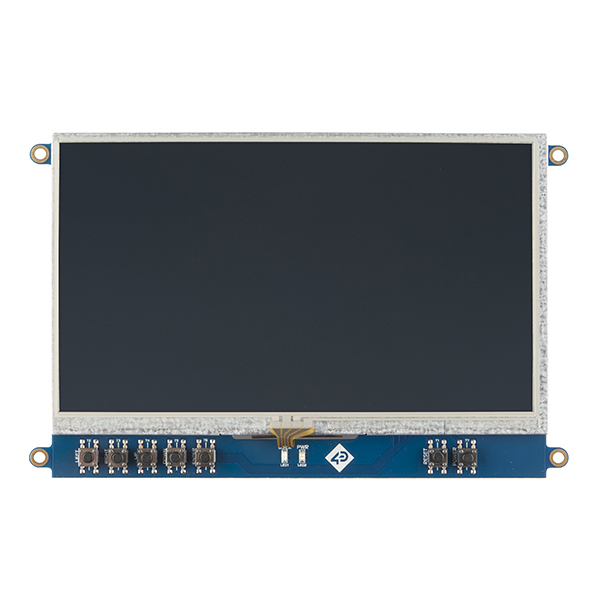 I own a 4.3 LCD TFT-LCD and was a pain to connected to the Arduino and load the right library. This cape worked right out of the box. I ran the calibration routine and the touch screen works well. The display is bright and has good resolution.